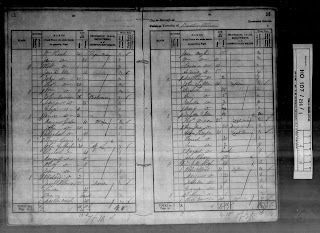 The 1841 U.K. Census is the first document in which I found Martha (Reay) Doyle with her children. (That census does not note relationship, but other research shows that these are her children.) They were living in Bedlington, Durham (whose records were sometimes combined with Northumberland's records). It seems that Martha and her family were living with Joseph and Susan Robinson, both 25, and a female infant, Frances. I noticed that there was a gap of six years between the oldest and next children; another gap of six years between two children, and that two boys were the same age. More than two years between births may suggest a miscarriage, a baby lost in childbirth, or the death of a young child. All were common occurrences in the early 1800s. 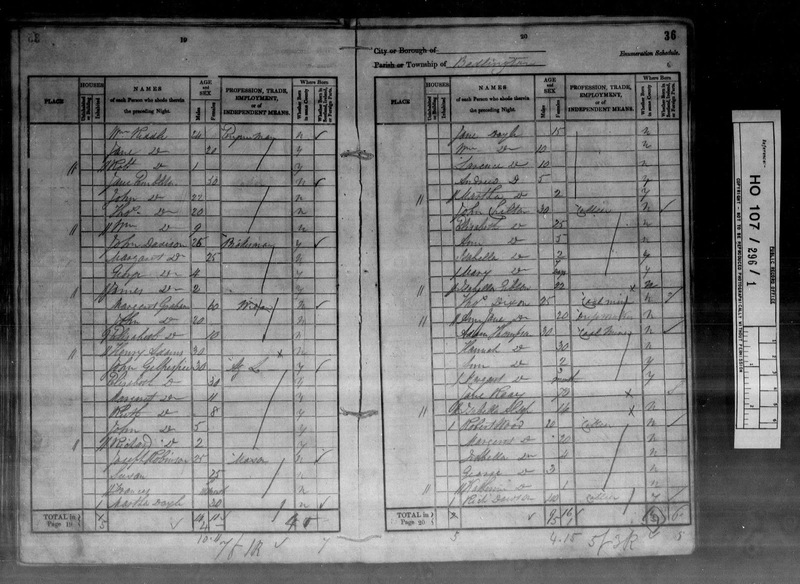 As I continued to search for the family in other records I came upon Martha Doyle, born 1833. Checking back to this census record, I was confused. Then I guessed there must be some mistake because Martha of the 1841 census was born about 1839. Perhaps someone misread the handwriting or part of the "9" had been erased and looked like a "3." In a parish register, I discovered that a child named Martha Doyle, daughter of William and Martha, was baptized in 1833, at St. Peter's Church, Wallsend, Northumberland. I posted this record and a transcription a few weeks ago. Could it really be that there were two Marthas? In early December, 2017, I ordered several death records from the U.K. GRO. One of them was a death certificate for a little girl named Martha Doyle. This is the record I received. And then I ordered a U.K. GRO birth record for Martha Doyle, born 1839, and received this. It's clear that there were two sisters, both named Martha, one born in 1833, the other in 1839. Because the older Martha died just six months before her sister was born, it's possible that naming the younger daughter Martha was a way of remembering and honoring the recently-deceased Martha. Is it possible that Susan Robinson was Martha's sister? There are about five years' difference in their ages. Despite the information in the 1841 census, the birth years of the children, as shown in other church and civil documents, are about two to three years apart. William was born about 1828 and Lawrence about 1830. Not all U.K. civil records give the mother's name, let alone her maiden name. I was grateful to find Martha Doyle identified as Martha Doyle, formerly Reay. As I learn more about finding British records, I'm grateful that various ones are available for free in so many places even if some are only transcriptions. Transcriptions can be excellent finding aids. Some online sources give more and/or different information than others, all of which is helpful when choosing which GRO birth, marriage, or death record to order. At this time I believe that William and Martha (Reay) Doyle had six children. It's possible that further searching will find births between the children born three years apart. As always, there's more research to be done. I have read of many instances of parents naming a child after a deceased sibling. The 1833 birth fits nicely between Lawrence and Andrew. My parents had neighbors whose daughters were all named Mary - Mary Patricia, Mary Theresa, etc. Hi, Wendy. I have only one other instance of a dead child's name being given to another child in the family (except there is also a Frederick and a Fred). I know in Germany first names are often repeated with a second name as a call name (Johann Sebastian, Johann Christian, Johann..., etc.) And I think the use of Mary as a repeated first name with a different middle name may be a Catholic tradition. In my tree I have many examples of “reusing” a name after a child has died. In one family this was done 3 Times. The family contains 2 Frederick’s, 2 Sarah’s and 2 Ellen’s. It makes me stay on my toes keeping up with who is who. Hi, Alice. Yes, siblings with the same first name do keep researchers on their toes to be sure not to confuse them. Nancy, you needed to do a lot of detective work on that one. I have a Irish family that had tow Margaret Mullanes. The first child died as a toddler and the next daughter was given the same name. I was confused at first, but like you, found sources that proved two different sisters with the same name. Sadly, in the Mullane family, the second Margaret also died very young. I think two children with the same name born just a few years apart could be the something that some family historians might overlook, especially if they're more interested in collecting names than in finding facts. It's always sad when children die but I find the situation with your Margaret Mullanes particularly sad -- the family tried to the preserve the memory of the first child by giving another child the same name, and both girls died. Heartbreaking. Great research on your part, though, Colleen. I was listening to a Genealogy Gems podcast yesterday, and a speaker was talking about the 1841 English census. This MIGHT be helpful to you. The census takers were instructed to round the ages DOWN to the nearest FIVE. So, if someone was 34, they would be listed as 30. You can see that, at least the adults on your census are all rounded to 5s. It appears that children were done differently. Maybe the instructions said to not round until a child reached a certain age? You might do a little more research and find it helpful. Hope this helps! Thank you for reminding me about this, Dana. It is something I heard a few years ago but forgot. I think it will be helpful to remember it. I've actually found birth and/or baptismal records for Martha and all her children except Andrew. William would have been 13 and Lawrence, 11. Thank you again for mentioning this, Dana. I appreciate it.